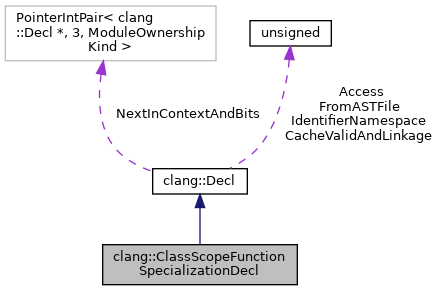 Declaration of a function specialization at template class scope. This is a non-standard extension needed to support MSVC. "template<> foo(int a)" will be saved in Specialization as a normal CXXMethodDecl. Then during an instantiation of class A, it will be transformed into an actual function specialization. Definition at line 2411 of file DeclTemplate.h. Definition at line 2450 of file DeclTemplate.h. Definition at line 2452 of file DeclTemplate.h. Definition at line 2436 of file DeclTemplate.h. Definition at line 935 of file DeclTemplate.cpp. Definition at line 2432 of file DeclTemplate.h. Referenced by clang::ASTDeclWriter::VisitClassScopeFunctionSpecializationDecl(), and clang::ASTNodeTraverser< Derived, NodeDelegateType >::VisitClassScopeFunctionSpecializationDecl(). Definition at line 2433 of file DeclTemplate.h. Referenced by clang::ASTNodeTraverser< Derived, NodeDelegateType >::VisitClassScopeFunctionSpecializationDecl(). Definition at line 2434 of file DeclTemplate.h. Definition at line 2429 of file DeclTemplate.h. Definition at line 2430 of file DeclTemplate.h.